Oh, the agony of teenage love triangles! Ao Haru Ride explores this in the form of two best friends having crushes on the same boy, but the unique twist here is that they actually manage to remain friends as they wrestle with their emotions. The fact that one of the characters is dealing with profound loss creates a backdrop of melancholy that makes the teen romance have a timeless and nostalgic quality. This volume delves more into Kou’s backstory as the recently formed friend group of Futuba, Yuri, Shuko and Aya are determined not to let Kou fail out of school. Kou’s issues are not because of a lack of ability, but he has difficulty getting himself to truly try at anything. 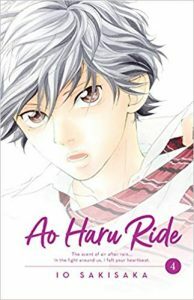 Kou is still struggling with the death of his mother, and the reader gets a flashback to see how he was put into a caregiving role during her illness at a young age. Kou’s walls of isolation from his friends don’t last forever as Futuba is determined to get through to him. There’s some great paneling and action sequences as they tumble together down a hill in a scene made for a romantic movie. As Kou embraces Futuba, she stays still so he won’t be embarrassed by her seeing him cry. One of the earlier themes in Ao Haru Ride is Futuba’s difficulty relating to traditionally feminine behaviors, and this is brought out again when the group decides to attend a summer festival together. Yuri shows up looking strategically adorable in a yukata, and Futuba starts to feel jealous. But when Kou sees another boy talking to Futuba it is clear that he’s not as indifferent as he pretends to be. Yuri observes his reactions, but the girls continue to affirm their own friendship even while navigating their crushes. Overall, this series just continues to be wonderfully executed shoujo. Sakisaka excels at capturing quiet moments between the characters that show the glimmerings of first love.